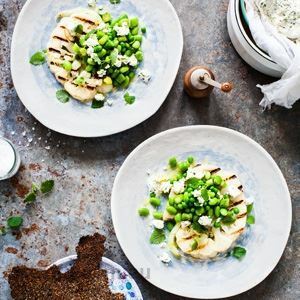 "Char-grilling cauliflower is a perfect example of how Nordic chefs are thinking differently about using vegetables. 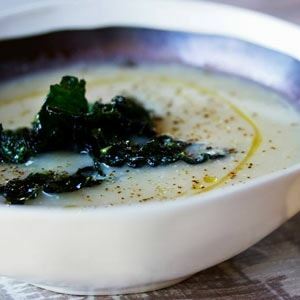 It's common to see this technique along with whole-roasting used on celeriac and cabbage among other veg – it features on many Nordic menus – and the charred flavour that it imparts on the cauliflower is delicious. Leftovers of this salad are good cold, although the cauliflower can easily be poached in the reserved stock to reheat it if you prefer. Lemon balm has a pleasant citrus flavour similar to verbena, which I love, and acts as a good substitute if the latter proves difficult to find.." ~ Simon Bajada. Fill a large saucepan with water, add the juniper berries and salt and bring to the boil. Lower the whole cauliflower into the water and boil for 7 minutes, or until a knife easily passes through the florets to the core. Remove from the water and leave to cool (this can take some time). When cool enough to handle, cut the cauliflower vertically into 2 cm (3/4 in) thick steaks. Some of the cauliflower steaks will not hold their shape and will crumble – these can be used in salads. Preheat a char-grill pan or plate over a high heat, brush the steaks with the olive oil and grill for about 3 minutes on each side until nicely charred. Cover with foil to keep warm and set aside. Meanwhile, bring the stock to a simmer in a saucepan. Add the peas, asparagus, broad beans and soy beans, cover with a lid and simmer for 4 minutes until the vegetables are warmed through. Remove the greens from the pan using a slotted spoon, reserving the stock, and transfer to a bowl. Stir through the olive oil and spring onions and season with salt and pepper to taste. Arrange the cauliflower steaks on a serving plate and top with the greens and cheese. 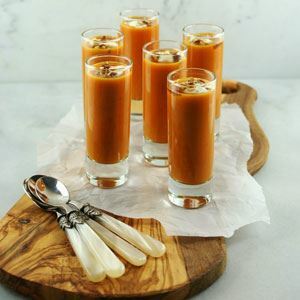 Spoon over a few tablespoons of the warm vegetable stock, then scatter over the lemon balm or mint leaves. 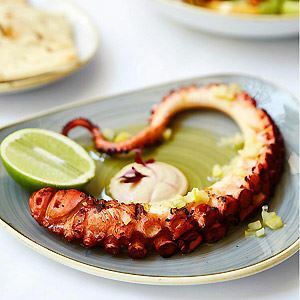 Serve with red cabbage chutney or rosehip ketchup, and accompany with crispbreads. 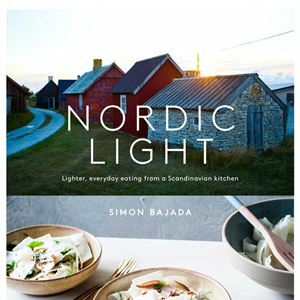 Credits: This is an edited extract from Nordic Light by Simon Bajada published by Hardie Grant Books RRP $49.99 and is available in stores nationally. Photo Credits: This is an edited extract from Nordic Light by Simon Bajada published by Hardie Grant Books RRP $49.99 and is available in stores nationally.